University faculty, staff and students must properly manage or dispose of all waste materials in accordance with university, local, state and federal policies and regulations. The Environmental Protection Agency (EPA) and the Virginia Department of Environmental Quality (VADEQ) closely scrutinize academic institutions and personnel. Improper disposal of waste can result in citations and fines for the university and fines and possible imprisonment for the individual. All this talk of fines is unnecessary, however, because UVA maintains a user-friendly waste disposal program. Environmental Health & Safety (EHS) answers waste collection questions and picks up your chemical waste upon request, free-of-charge. Take the time to follow the simple guidelines below, and call EHS if you have any questions. Do not put hazardous waste down the sink or in the trash. If you are not sure if a chemical is hazardous, call EHS. 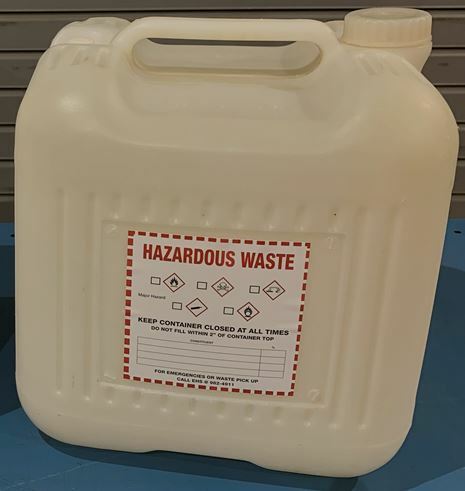 EHS provides the following containers for chemical waste collection, activities requiring special containers are evaluated on a case-by-case basis. DO NOT FILL CONTAINERS TO THE TOP. Fill plastic carboys ONLY to the fill line. Leave about 2 inches at the top of all other containers. All waste must reside in closed, non-leaking containers. Do not use flasks or test tubes with stoppers, beakers with parafilm, or bottles with ground glass stoppers. The outside of the waste container must be reasonably clean. Do not put liquids in containers designed for solids. They leak! All chemical waste containers must remain CLOSED (capped) except when waste is being added—this is a regulatory requirement. Additionally, when chemical waste containers are left uncapped, laboratory personnel are at the risk of chemical exposure due to inhalation of chemical vapors. It is very important that the waste container is made of a material that is compatible with the waste to be put in it. Do not put acidic or basic waste (pH <3 or >9) in metal cans. Metal cans corrode in a very short time. Liquid waste should NEVER be put in this type of container. 5 gallon bucket used for solid and gel waste (including ethidium bromide contaminated gels). On April 8, 2018, the Commonwealth of Virginia adopted the Environmental Protections Agency's (EPA) Hazardous Waste Generator Improvements Rule. One major change this new regulation brings is more stringent labeling requirements for hazardous waste. 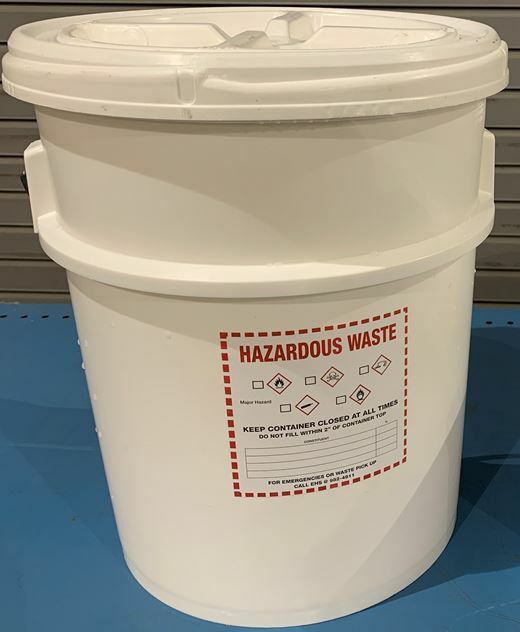 Previously, a container of hazardous waste needed to be labeled with either the words "Hazardous Waste" or a description of the contents of the container (e.g. "methanol", "flammable solvents"). The new regulations require containers of hazardous waste to be labeled with the words "Hazardous Waste" AND a description of the contents of the container. 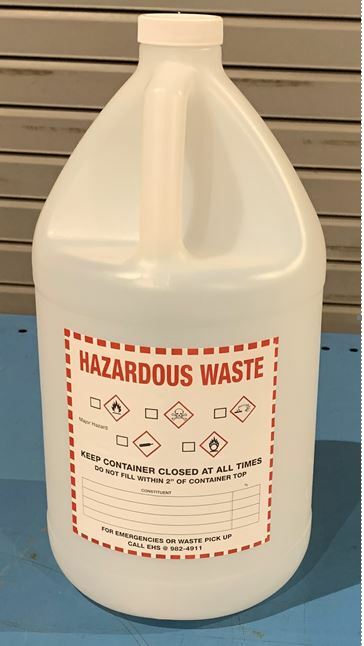 In order to make compliance with these new requirements as easy as possible, EHS has redesigned UVA's Hazardous Waste Stickers, an example can be seen below. This new sticker provides space on which to write the contents of the container and to select (check) the appropriate Globally Harmonized System (GHS) pictogram. The example below shows proper labeling for a flammable solution. When filling out the stickers be sure to select the appropriate GHS pictogram AND to include the contents of the container. These changes do not affect the requirement to fill out an EHS Waste Disposal Ticket for each container of waste prior to pickup. In addition to waste stickers, all waste containers MUST have a Waste Disposal Ticket (see image below), affixed to it prior to pick up. This label is issued by EHS. This includes chemicals still in their original containers. Waste will not be picked up if it is not labeled properly. If you need new labels, let us know and we will deliver them. The label should be affixed to the waste container by a single piece of tape across the top of the label. Date, Lab Director (P.I. ), Department, Name of the person filling out the label, Building, Room Number, Phone Number. The names of all the constituent contents of the container. Do not use abbreviations, chemical formulas or chemical diagrams. The corresponding percentages of these constituents. The total quantity of material in the container. IMPORTANT: Disposal companies will not accept unknown chemicals. You must make every possible effort to accurately describe the contents of each container. This means tracking down and questioning previous lab occupants if necessary. In order to minimize the chances of incompatible materials being mixed together and to keep disposal costs for the University as low as possible, we ask that you keep certain types of chemicals separated at the time of collection. When combining different materials, always check the SDS to be sure they are compatible materials, or call EHS for guidance. 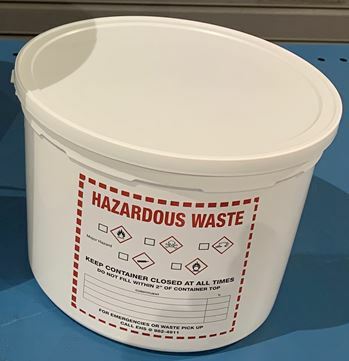 Hazardous Waste Collection Guidelines for persons generating/collecting Hazardous (Chemical) Waste in NON-laboratory areas can be found here. Keep the following groups in separate containers whenever possible and use the associated GHS pictogram to identify the hazard on the waste label when applicable. -Solutions containing compounds of the following metals: arsenic, barium, cadmium, chromium, lead, silver and selenium. -Note: Do not put acidic or basic waste (ph <3 or >9) in metal cans. Metal cans corrode in a very short time. Keep acids and bases separate from hydrocarbons and ethers. -Note: A recent change in the Virginia Hazardous Waste Regulations requires that all unwanted aerosol cans be collected as Hazardous Waste. -Lamps/Bulbs - Fluorescent lamps and high intensity discharge bulbs contain mercury and must be recycled. Facilities Management should handle any bulbs from the lighting systems of buildings as part of general maintenance. Smaller bulbs from laboratory equipment can be given to EHS for disposal. -Batteries - EHS will take lithium batteries, and damaged/defective batteries. UVA Recycling accepts lithium, lithium ion, lithium rechargeables, lead acid, alkaline, nickel cadmium, nickel metal hydride, 9 volts, and button batteries. -All sharps (Needles, razor blades, scalpel blades, etc. ), whether they are contaminated with trace chemicals or uncontaminated, must be placed in a sharps container. See our biological waste page for additional guidance. Always use the sharps container with the top in place. Sharps container are available from EHS via our pickup & disposal request page. Avoid using sharps containers for uncontaminated glass. See our waste laboratory glassware guidance (WLG). Empty Container Disposal: We do not pick up empty chemical reagent bottles, and neither does UVA Recycling. Triple rinse empty chemical bottles, collect the rinsate as waste, deface the chemical label, and then discard bottles in the trash or reuse for waste collection. Ethers tend to form extremely explosive compounds over time. Therefore, date all ether cans. Do not keep an open ether can for more than 1 month or an unopened can for more than 12 months. If you have an old ether can, label as waste and call EHS for pick up. Do not attempt to open any bottles of DRY picric acid. This is an extreme explosion hazard!!! Any dry bottles of picric acid should be labeled as waste and picked up by EHS staff. Call EHS at 434-982-4911 to schedule a waste pickup. Chemical waste will be picked up within three working days from the date it was requested to be picked up.